Sanctions On Russia Allege A Story Of Power, Money And Corruption The Treasury Department's announcement of new sanctions on powerful Russians describes a global soap opera about power and money at the highest levels. 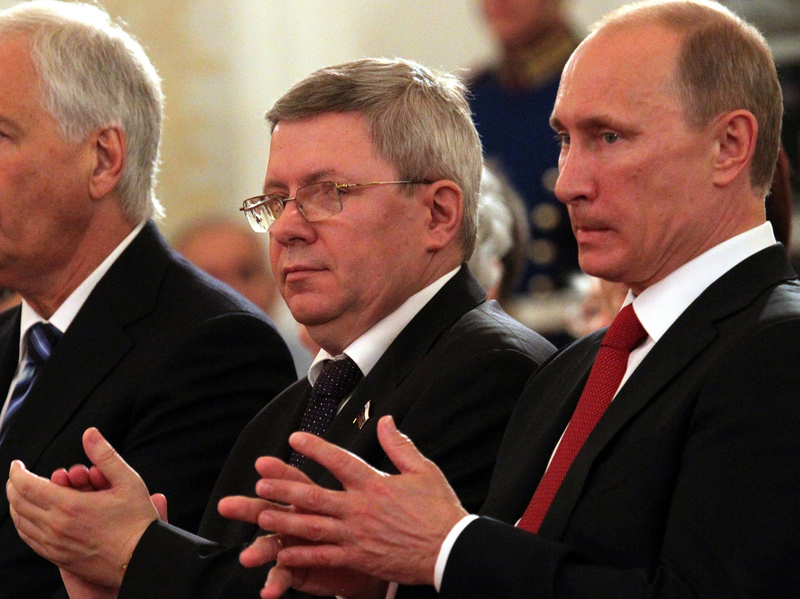 Russian politician Alexander Torshin, with Russian leader Vladimir Putin, is one of a number of powerful Russians sanctioned by the United States on Friday. The Treasury Department wove a sprawling epic about global power and money on Friday in announcing new sanctions that target some of Russia's most powerful men — including three with ties to Trump world. The announcement included everything necessary for a first-class soap opera, from arms trafficking to organized crime to the smuggling of millions in cash in suitcases. "The Russian government engages in a range of malign activity around the globe, including continuing to occupy Crimea and instigate violence in eastern Ukraine, supplying the Assad regime with material and weaponry as they bomb their own civilians, attempting to subvert Western democracies, and malicious cyber activities," Mnuchin said. "Russian oligarchs and elites who profit from this corrupt system will no longer be insulated from the consequences of their government's destabilizing activities." The Treasury Department announced new sanctions against seven Russian "oligarchs" — billionaire business titans, often with close relationships to Russian President Vladimir Putin — 12 of their companies, 17 Russian government officials and two Russian companies, including its state arms exporter. The restrictions on their ability to use American banking, do business in the United States or have other dealings with U.S. institutions are the latest punitive measures imposed by the West in view of what it calls Russia's pattern of aggressive conduct. Moscow has responded in kind, including by ejecting an equal number of intelligence officers as those kicked out by the United States and several European governments following the poisoning attack of a former Russian spy and his daughter in the United Kingdom. Aluminum plunderbund Oleg Deripaska, for example, a onetime patron of former Trump campaign chairman Paul Manafort, is a private business titan who was described by the Treasury Department on Friday as having "acted or purported to act for, or on behalf of, directly or indirectly, a senior official of the" Russian government. Deripaska holds a Russian diplomatic passport, for example, and has said he represented Moscow to other countries. The Treasury Department adds this: "There are also allegations that Deripaska bribed a government official, ordered the murder of a businessman, and had links to a Russian organized crime group." Alexander Torshin, deputy governor of the Central Bank of the Russian Federation, is notable in that he has cultivated deep ties with the National Rifle Association for years. He has met four NRA presidents and attended five NRA conventions in the United States, including one at which he met Donald Trump Jr. in 2016. The House intelligence committee said, apparently based on Trump Jr.'s account, that the two did not discuss the election. Kirill Shamalov, Putin's son-in-law, co-owns a company for which a shipping company owned by U.S. Commerce Secretary Wilbur Ross has transported natural gas. Steelmaker and Duma deputy Andrei Skoch is described as having "long-standing ties to Russian organized criminal groups, including time spent leading one such enterprise." Gold baron and Russian Federation Council member Suleiman Kerimov is described as having allegedly transported millions of euros in cash to France without reporting the transfers to French authorities. "He is alleged to have brought hundreds of millions of euros into France — transporting as much as 20 million euros at a time in suitcases, in addition to conducting more conventional funds transfers," the Treasury Department said. "Kerimov allegedly launders the funds through the purchase of villas." The Treasury Department's singling out of Kerimov for allegedly smuggling cash out of Russia followed a report this week by CNN that said Justice Department special counsel Robert Mueller's office has been interdicting wealthy Russians as they fly into the United States in order to interview them about potentially transporting cash. If Russia funneled money to American political campaigns or organizations as part of its attack on the 2016 election, one way it might have done so is by simply smuggling paper dollars in order to avoid electronic transfer records. Foreign contributions are barred in U.S. elections. So cash could have been shipped to the United States and seeded with political groups or individuals to make the money appear to be legitimate contributions, according to the CNN report. Kerimov's alleged technique of purchasing of "villas" to launder his money also comports with questions that Trump opponents have asked about his business relationships with wealthy foreigners. One way in which illicit money allegedly moves out of Russia is via real estate. A rich person buys property in the West — in London, New York or South Florida — without living in it. Instead, hot real estate markets in those places make it simple to resell a condo or a mansion and free up legitimate cash. In Kerimov's case, he was allegedly using this scheme in the south of France when he was arrested in Nice last year. In 2008, Donald Trump sold an estate he had purchased for around $42 million in Palm Beach, Fla., to Russian tycoon Dmitry Rybolovlev for $95 million. Rybolovlev then subdivided the property and began to sell it off as separate parcels, recouping some of the difference. Sen. Ron Wyden, D-Ore., an opponent of Trump, has asked Mnuchin and the Treasury Department to provide information about that sale as part of Congress' job to "follow the money and conduct a thorough investigation into any potential money laundering or other illicit dealings" Trump may have had. Trump and his associates deny any wrongdoing or business relationships with Russians. Russia's active measures against the United States ranged from the theft and release of embarrassing political emails to social media agitation on Facebook and Twitter to exploratory cyberprobes of state elections systems. They involved a web of intermediaries and cutouts in the same way as the practices described by the Treasury Department sanctions. Government cyber operatives stole emails from the Democratic National Committee and other victims but used purportedly independent actors — the now-shuttered Russian-created website DCLeaks or the anti-secrecy website WikiLeaks, which endures. In June 2016, when Manafort, Trump Jr, and Jared Kushner met with a delegation of Russians in New York City after what emails to Trump Jr. described as an offer of help by the Russian government, none of the people they hosted were Russian government employees. Instead, Trump Jr.'s emails described the desire to reach the Trump campaign that originated with a Russian official — federal prosecutor Yuri Chaika — but which traveled along a path of cutouts: Chaika talked to Donald Trump's onetime business associate, who then spoke to his son, who then spoke to his publicist, who then contacted Trump Jr.
Trump Jr., Kushner and Manafort all have denied conspiring with the Russian attack on the election. Manafort is facing federal charges that allege he acted as an unregistered foreign agent and laundered money, but he is not charged with conspiring with Russians who were attacking the election. Manafort has pleaded not guilty and has sued the government asking to dismiss the case. There are geopolitical implications to Friday's sanctions announcement beyond the U.S.-Russia investigation. For example, the targeting of Russia's lucrative state arms exporter, Rosoboroneksport, could complicate its ability to sell weapons to clients such as the Syrian government. NPR correspondent Tim Mak contributed to this report.